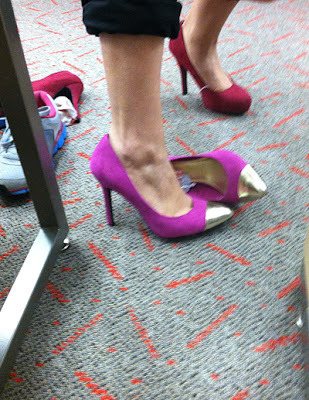 lynette marie: Target Clearance Shoes?! What're you doing tonight after work? Nothing? Good. So you can run to your nearest Target and shop to your hearts content. Or until you run out of money, I guess. So I was wandering around Target this morning in a sleepy, stumbling state of exhaustion, picking up a few things and ignoring the 23432 other things I need to do, like check my e-mail and make about a dozen phone calls and shower (for the first time in three days). MY EYES HAVE SEEN THE GLORY. Almost every single normal shoe shelf was empty, and just about every gorgeous, sequined, jewel-toned, animal-print shoe was on the clearance wall, 50% off. I did not see a single shoe for more than $17, and I saw them as low as $9. Since all the normal shelves were empty, I'm assuming these little beauties just got moved over within the last day in order to make room for spring arrivals. I really, really loved those magenta ones, because that's definitely a color I can't get enough of right now, but these darker raspberry heels were definitely something that would more seamlessly fit into my wardrobe, so for $14.98, these little babies hopped into my arms and came home with me. So go to Target and buy every shoe. That is all. Such good deals at Target right now! It's unbelievable! So many purses and scarves and shoes for so cheap! I was there yesterday, but mine was cleaned out of most sizes but 10. Boo to me. I hope you got the pink heels, I love them! Ahh that looks amazing! 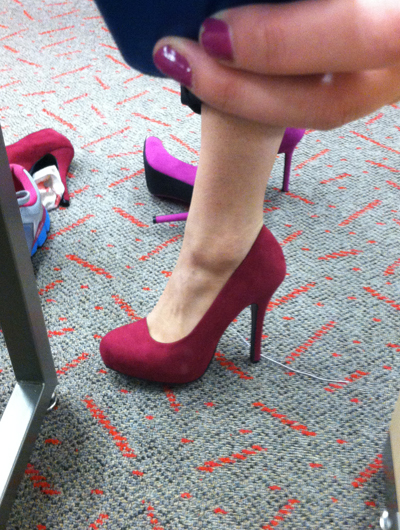 I love Target shoes, but their heels always hurt my feet, which saddens me. A lot of girls have told me that! I think I must have just beaten my feet into submission from years and years of wearing cheap heels, LOL. Team raspberry! Those are amaze! :) I'm totally going to the Targ this weekend. GO MO GO MO GO MO! UGH jealous! haha :P I dont have a Target! I almost just started crying for you. Such a sad sad thing. Those leopard loafers look just like the Steve Madden ones that I think were going for like, $58 last I checked. These ones were marked down so low! Shoe heaven! I love the heels you picked out! I will def. have to go to my nearest one! Amazing shoe find at Target! I love the gold capped ones! I think the burgundy pair was a great decision. I love the shape! 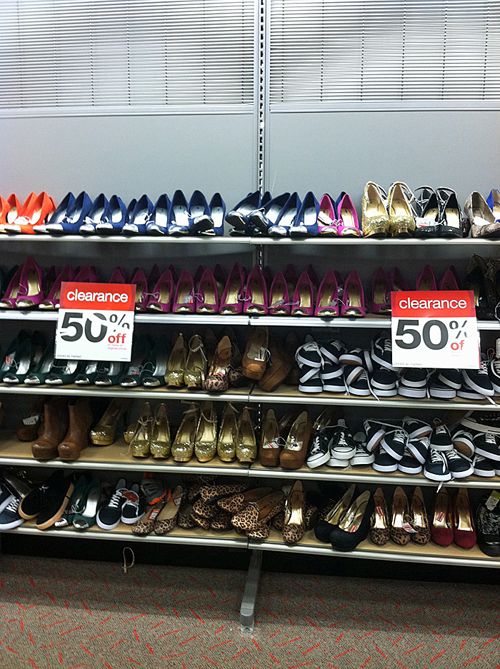 Unfortunately for me, our local Target didn't have any good shoes left on clearance. BOO. Oh Target. Why not have endless supplies of clearance items? Sad day. i always get sucked in by the clearanced shoes at target, in fact i spotted those same burgundy colored heels on the left last week but couldn't pull the trigger. if they're still at my local target when i go there today i'm definitely gonna grab 'em (it's my goal to add more colored shoes to my closet this year!). NARS Foreplay Blush Palette Review! New Revlon Photoready BB Cream Review! I'm a Liebster Award Nominee! December 2012 Favorites & Unfavorites! Disclosure: I may receive a commission if you click through a link and make a purchase.